The following work sequence shows you how to install the freeware image viewer "Irfanview" (www.irfanview.com) on Linux. The reported problems with the installation are all referred to the installer that requires a certain Windows DLL file. If you have access to a Windows PC on wich IrfanView is installed, you can also copy the IrfanView folder (e.g. 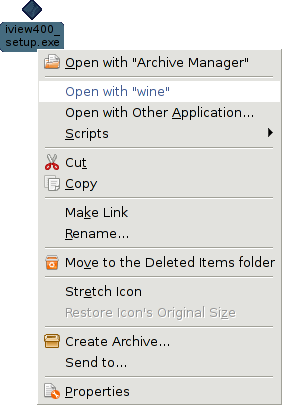 C:\Program Files\IrfanView) to the particular wine folder (e.g. /home/USERNAME/.wine/drive_c/Program Files/IrfanView/). I wrote this installation guide in 2007 while using Ubuntu Linux 7.04 (Feisty Fawn). Install the package wine on your system. Get the file mfc42.dll from the folder C:\windows\system32 of a running Windows system. Copy this file to the analogous wine folder /home/USERNAME/.wine/drive_c/windows/system32. Download the setup file (e.g. iview400_setup.exe) for IrfanView (www.irfanview.com). Figure 1. Image of the context menue for Windows executables. Figure 2. Image of the dialogue for creating a new Launcher.